Arpaio, who called himself “America’s Toughest Sheriff,” proved it by requiring his inmates to wear pink underwear and live in tents outside in the intense Arizona heat. But the attack under the Obama administration began in 2011 with the filing of a lawsuit by Manuel de Jesus Ortega Melendres who claimed that the sheriff exceeded his authority by conducting raids and traffic stops based on race. Arpaio said he was acting within his authority: During those raids and traffic stops he required his deputies to ask, among other information, their immigration status. Most of those stopped were found to have false or fake identification, which was enough for the sheriff to incarcerate them and notify ICE (Immigration and Customs Enforcement) officials. His philosophy was simple: Remove them from the county before they committed more crimes. It is not a violation of federal criminal law to be in this country without authorization in and of itself. Thus, the MCSO [Maricopa County Sheriff’s Office]’s policy that requires a deputy (1) to detain persons she or he believes only to be in the country without authorization, (2) to contact MCSO supervisors, and then (3) to await contact with ICE pending a determination [on] how to proceed, results in an unreasonable seizure under the Fourth Amendment to the Constitution…. Thus, to the extent [the department] uses race as a factor in arriving at reasonable suspicion or forming probable cause to stop or investigate persons of Latino ancestry for being in the country without authorization, it violates the Fourth Amendment. In addition, it violates the Plaintiff class’ right to equal protection under the Fourteenth Amendment to the Constitution and Title VI of the Civil Rights Act of 1964. Not only did Defendant [Arpaio] abdicate responsibility, he announced to the world and to his subordinates that he was going to continue business as usual no matter who said otherwise. Bolton, who was nominated to the district court in 2000 by former President Bill Clinton, has been a thorn in the side of the Arizona legislature’s attempts to support police efforts to identify illegal aliens within the state. On July 28, 2010, she issued a ruling blocking key portions of SB 1070, which gave the state the authority to effectively enforce immigration laws, allowing its state troopers to crack down on illegal immigrants. When Arpaio tried to appeal and demand a trial by jury, Bolton denied it on the grounds that the law did not require juries in cases where the potential jail term (six months) was so short. We will need to work with the guests who are here in our nation and are pursuing citizenship and separate that from those who are committing crimes and make sure that we a caring community that is serious about public safety. Even though Arpaio hadn’t been sentenced — that was scheduled to take place in October — he plans to appeal Bolton’s ruling against granting him a trial by jury. 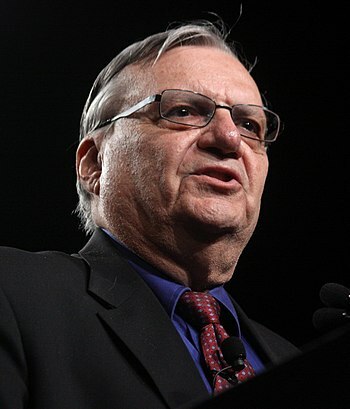 At age 85, Arpaio is still a fighter. This entry was posted	on Saturday, August 26th, 2017 at 7:48 pm	and is filed under Crime, Fourth Amendment. You can follow any responses to this entry through the RSS 2.0 feed. You can leave a response, or trackback from your own site.